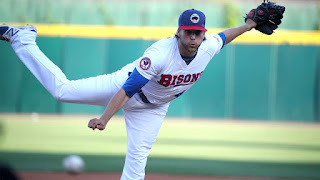 BUFFALO, N.Y. -- Chris Rowley made his first start in Triple-A under special circumstances last season--not only for himself but for the Bisons as well. Rowley, a first lieutenant in the United States Army, got the starting nod as the Herd celebrated America's independence. Prior to his arrival in Buffalo, Rowley, a native of Georgia, was unaware of the significance of the annual summer event hosted by the Bisons. "I didn't know," Rowley said about his knowledge of the Independence Eve celebration. "Obviously, I do now. I didn't realize how much of a tradition it was really until afterward. Having seen it now, I understand how cool it is and how much of a production the team puts on here." An Independence Day celebration fuses the game baseball, America's pastime, with the colorful sights and sounds of one of the most widely commemorated summer holidays. Rowley agreed that he got the sense from his teammates that they also understood the value the day holds. "That's something that I'm familiar with," Rowley commented on playing baseball centered around the backdrop of Independence Day. "July 4th is always a special time to play baseball because the sport that we play is a symbolic sport for the history of the United States and guys definitely understand that and appreciate it." Being able to pitch on a day when the team was celebrating the nation's independence provided Rowley with a memorable first win on the mound playing for the Bisons. "That was really cool," Rowley said. "It's not really something I thought about during, but whenever the game was over, and you know, I was talking to the media and family, friends, etc. It was something that was really cool because obviously the context of the game and the timing of the year and all that stuff." In that start, Rowley was excellent, tossing five innings and only allowing one run on three hits while striking out six batters. For Rowley, this provided a launching pad for taking his game to the next level, especially as a starting pitcher. "Before then, I had gone back and forth from the bullpen and the rotation at every level," he recalled. "I was always comfortable starting… I think that was really when I started to cement myself more as a starter rather than a reliever." Last season marked another first for Rowley. In August 2017, he was called up to the majors for the first time. With the promotion, Rowley etched his name into baseball history-becoming the first West Point graduate to play at the Major League level. "I think at the time it wasn't something that I really understood the significance of," Rowley remembered. "As the days and weeks and months passed since then, it has kind of settled for me and how important that was not only for me and my family but how significant it was for the Army and the United States Military Academy." "To be the first, it's not something you ever imagine or dream of," he said. "It's really a humbling thing… I'm definitely trying to bear that accomplishment with humility and grace." Aside from the promotion to the majors, Rowley has been on the Bisons' roster since last June. He noted the uptick in the skill level of the opposing hitters at the Triple-A level. "I think that any time you spend a significant amount of time at a level or at the higher levels specifically, number one, obviously, the players are good," Rowley noted. "The higher you go, the better competition you're going to face. Going around this league [the] second time through, they've seen me." This aspect of baseball poses unique challenges, particularly for pitchers. "It's been a little bit more of a challenge to compete and have success when you're facing guys that are familiar with you, they've got a book on you, they know what you are going to throw. They know pretty much all the ins and outs of your repertoire and how you attack games." The challenges presented to a pitcher form a somewhat paradoxical enjoyment of the game. "It has just been a challenging but fun year because it's my first year that I've spent at the same level," Rowley noted. "I was here last year and now I'm back at this level again and I'm facing a lot of the same guys who I faced before." Rowley went undrafted after graduating from West Point but in 2013, he received an invite to play for the Gulf Coast League Blue Jays, the rookie level minor league affiliate of the Blue Jays' organization. He only played part of a season before he had to put his baseball career on hold. Rowley was required to abide by his commitment to serve five years of active duty in exchange for attending West Point. Upon graduation, cadets enter the United States Army as officers. While on active duty for 30 months, Rowley continued to work to keep his arm and body in baseball form as much as possible. "I never threw off of a mound," Rowley recollected. "I missed all of 2014 and 2015… I did play catch." Rowley was able to maintain his routine to a certain extent after receiving some help from a medic in his company. "The senior medic in my company was a baseball player and we would play catch two or three times a week during baseball season," he said. As arm injuries at the professional ranks have become more prevalent and frequent among pitchers, Rowley believes the time spent away from baseball helped him keep a clean bill of health. "It was really like a lot of downtime for me," Rowley remembered. "which was bad obviously because I [was] missing baseball, missing opportunities but I think it was good for my arm and for my health because I was able to get some rest." Rowley was granted a release from his five-year obligation through an exception. In 2016, he was placed on Individual Ready Reserve, which allowed him to resume his professional baseball career. Rowley was truly unselfish in making the decision to return to professional baseball. He stayed true to the values the military instills upon its members--honor, duty, valor and perhaps most importantly, respect. "It was really important for me that I had the support of my commanders," Rowley said. "[My commanders] had my back… and understood that it was a beneficial move both for me and for West Point and the Army as a whole." "For my personal situation, I think they realized it could be a good thing all around." Last season, Rowley started eight games for the Bisons and pitched to a 2.66 ERA in 64.1 innings while striking out 46 batters. In 2018, Rowley has been a reliable arm in the starting rotation and is building on his success and experience from last year. He owns a 3.14 ERA in 83 innings pitched with five wins and 49 strikeouts (stats as of June 30). Rowley, 27, has set some goals for himself for the rest of his playing career moving forward. "I'm really just concerning myself with going out there and competing every night and helping the team win and getting back to the big leagues." For now, Rowley remains a key piece of the Bisons' starting rotation and of the team as a whole. Heading into the final months of the season, Rowley will play a vital role in helping Buffalo accomplish something it hasn't done in more than a decade--claim the International League North division title and reach the postseason.